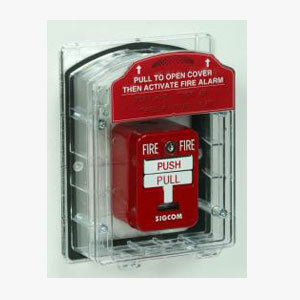 Global Fire Control's manual pull station cover is a rugged poly-carbonate cover used to help protect manual pull stations and other devices from false alarms, vandalism, dust and weather. It comes in a variety of figurations to satisfy most applications. It meets the requirements of the Americans with Disabilities Act (ADA). Specifically, it has been tested by Underwriter's Laboratories, for compliance with the 5lb. pull force requirement. In addition, the total depth of the unit when mounted is less than the required 4 inches.